In 1844 the famous "pathmarker," John C. Fremont, came into the Mojave Desert from the Tehachapi Mountains on the second of his several expeditions through the West. While still in the Tehachapis, a San Fernando Mission Indian rode into camp one day and offered to conduct Fremont and his men to an old Indian route that led to the Spanish Trail. Upon finding the Indian trail, which Fremont said was almost imperceptible from lack of use, the guide followed it for a few miles before halting to point out a black butte at the base of the mountains where water was to be found. Pointing at the trail, he said, "aqui es camino, no se pierde -- va siempre" (Here is the road, you cannot lose it -- it goes forever). The guide then left them, heading south to his home in San Fernando. After a difficult march of 18 miles, a general shout announced that we had struck the great object of our search -- THE SPANISH TRAIL -- which here was running directly north. The road itself, and its course, were equally happy discoveries to us. Since the middle of December we had continually been forced south by mountains and by deserts....The course of the road, therefore, was what we wanted; and, once more, we felt like going homewards. A road to travel on, and the right course to go, were joyful consolations to us; and our animals enjoyed the beaten track like ourselves. Relieved from the rocks and brush, our wild mules started off at a rapid rate, and in 15 miles we reached a considerable river, timbered with cottonwood and willow, where we found a bottom of tolerable grass. 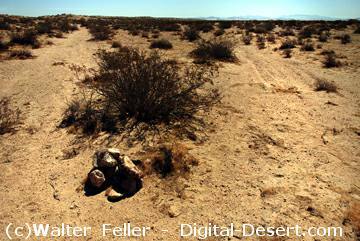 The travelers had reached the Mojave River at the upper crossing. Fremont made no mention of an Indian settlement at the crossing, nor was there any noted by those to come later. The Indians' departure very likely was due to the Santa Fe traders, many of whom badly abused the native inhabitants. The Indians quickly learned to avoid the caravans, and since Topiabit was directly in their path, it is no wonder it was abandoned. A clear bold stream, 60 feet wide and several feet deep, had a strange appearance, running between perfectly naked banks of sand. The eye, however, is somewhat relieved by willows, and the beautiful green of the sweet cottonwoods with which it is well wooded. As we followed its course, the river, instead of growing constantly larger, gradually dwindled away, as it was absorbed by the sand. We were now careful to take the old camping places of the annual Santa Fe caravans, which, luckily for us, had not yet made their yearly passage. A drove of several thousand horses and mules would entirely have swept away the scanty grass at the watering places, and we should have been obliged to leave the road to obtain subsistence for our animals. After riding 20 miles in a northeasterly direction, we found an old encampment, where we halted. This encampment was later a way station called the Cottonwoods. On April 23rd the party made a long march of 33 miles, arriving at the Junction (later Forks of the Road), the point at which the trail left the river in a northeasterly direction. The next day they continued along the river for another eight miles and encamped for the night. Upon resuming the trek, Fremont stated, "We left the river abruptly, and, turning to the north, regained in a few miles the main trail, (which had left the river sooner than ourselves) and continued our way...."
Forks of the Road. The fork on the left heads northeast toward Utah while the fork on the right finds it's way along the old Mohave Indian Trail toward Needles and the Colorado River.